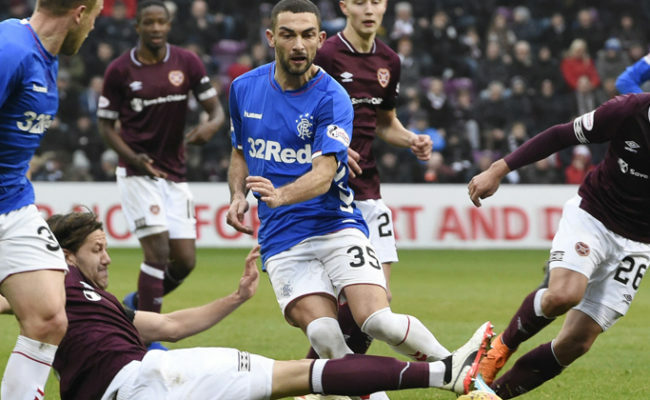 Twelve months on and the contrast could hardly be greater as a disappointing campaign ended with defeat by Hearts for the first time in six years. Such was the poverty of the fare on offer that there was probably more happening before the game than in the 90 minutes that followed. A minute’s silence for the victims of the Maryhill factory explosion had been preceded with the presentation of a bouquet of flowers to Henning Berg, Michael Mols and the de Boer twins. The gesture was to acknowledge the quartet’s imminent departure from Ibrox although it remains to be seen whether more will follow out the exit door in the summer. For those who intend remaining Rangers players this was the penultimate chance to prove to the manager that they deserve to feature in his plans next season but sadly too few took the opportunity in a tired match that bore all the hallmarks of an end-of-season affair. 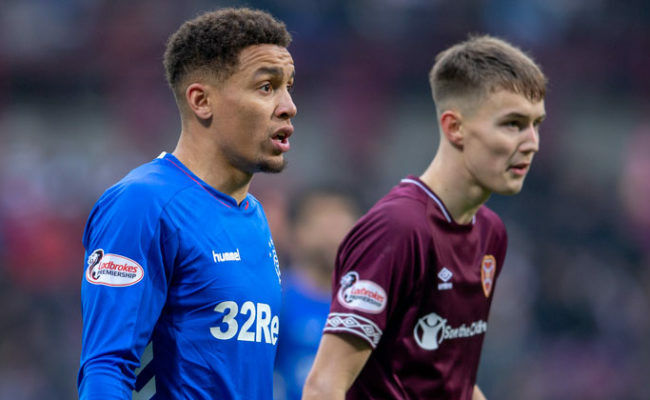 Hearts – without a win over the Ibrox side since 1998 – arrived at Ibrox without key striker Mark de Vries and missing defensive duo Steven Pressley and Alan Maybury, and signalled their intentions by leaving Graham Weir as their solitary striker. As has often been the case this season, however, Rangers seemed to lack the guile or endeavour to break down their opponents. In the early stages both sides traded half-chances; Chris Burke volleying wide after seven minutes before Joe Hamill benefited from Alan Hutton’s mis-control to shoot just wide. 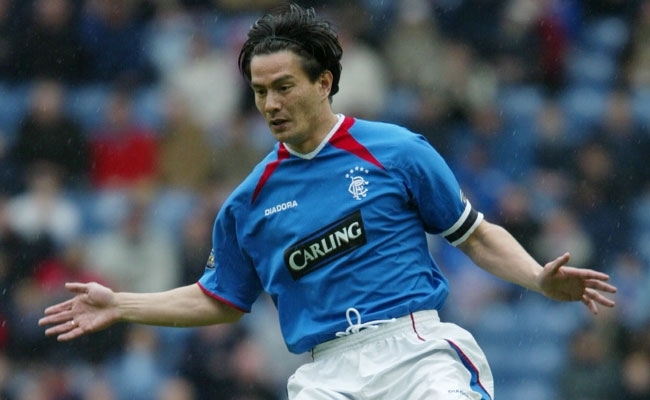 On his last home appearance after five bitter-sweet years, Mols offered a glimpse of the attributes that had made him an instant success when he arrived from Utrecht in 1999. In one cameo moment he latched onto a through ball from Paolo Vanoli, burst away from the defence before unleashing a serving drive that twisted narrowly wide of the Hearts goal. Moments later and the other side of Mols’ game reared its ugly head as he spooned a pass high into the air as he tried to control it. Sadly of late the bad moments have outweighed the good. With Rangers failing to press home their superiority, Hearts were growing ever adventurous and Scott Severin’s goalbound header was nodded over by Hutton before Neil Macfarlane pummelled a shot just wide from the resulting corner. Rangers’ last chance of a dismal first half came 12 minutes before the break when Arteta fired in a low free kick that almost deceived Craig Gordon at his near post, with the goalkeeper reacting smartly to dive low to his right to keep it out. McLeish tried to breathe fresh life into his flagging outfit by sending on Peter Lovenkrands and Mo Ross at half-time but it was Hearts who struck first after the break to go in front on 49 minutes. Hutton – moved to centre-half to replace Frank de Boer – was short with a back pass and Hamill nicked in to slam a low drive past Allan McGregor. It was hardly a surprise given Rangers’ stop-start performance and could have been worse on the hour mark when Paul Hartley released Weir and only a smart stop from McGregor blocked the young striker’s drive. 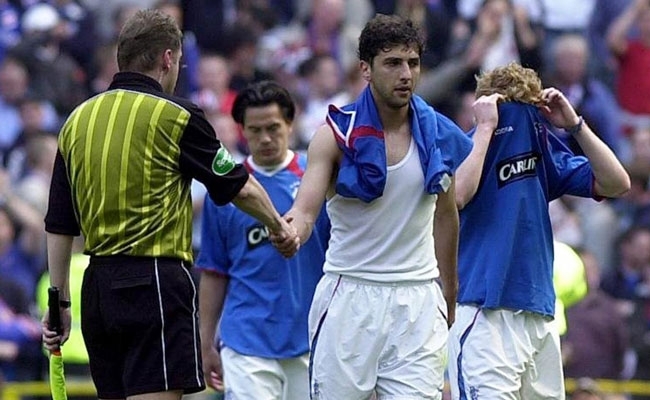 Moments later Rangers seemed to have a decent shout for a penalty when Mols was bundled to the ground by Andy Webster – ref Dougie McDonald wasn’t convinced – before the Dutchman was replaced by countryman Ronald de Boer as Rangers tried to claw their way back into the match. However, even the mercurial de Boer was unable to offer one last fleeting glimpse of genius to save the match and – just like Rangers’ season – the match gradually petered out.